In today’s competitive market conditions, businesses should build their mobile solutions compatible with all (or, at least, the most popular) mobile operating systems. It is both time- and cost-consuming to create apps separately for each platform using native technology stacks. Fortunately, there are reliable cross-platform development tools that allow a developer team to deliver near-native solutions to use single code across various platforms with minimal adaptation and correcting. In this article, we’ll tell you in detail about the benefits of mobile cross-platform development with Xamarin. Xamarin is a software company that created implementations of the Common Language Infrastructure (CLI) and was acquired by Microsoft in 2016. Xamarin is a development platform as well that aims at creation of mobile applications for iOS, Android and Windows. How good is Xamarin? Judging by the statistics, Xamarin’s products are quite popular around the world: according to the company’s reports, more than 15,000 organizations and 1.4 million developers were using them in 120 countries as of April 2017. Among the most renowned customers are Bosch, Siemens, Slack, Pinterest and others. 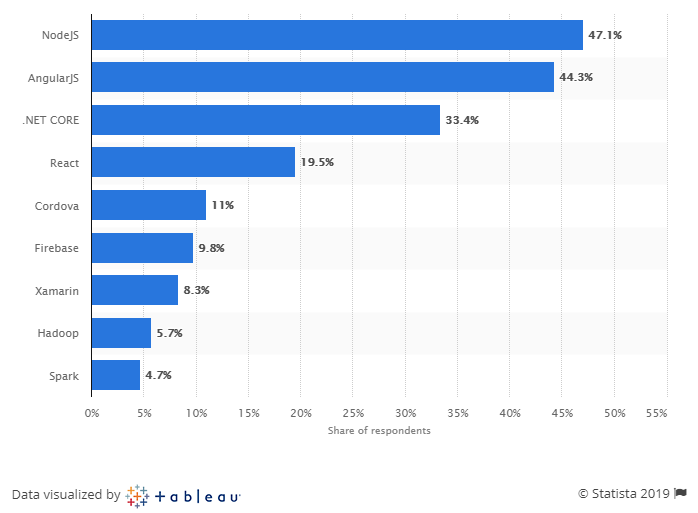 Statista also proves the popularity of Xamarin by including it in the list of the most used frameworks among software engineers. Hence, to make one app compatible with three platforms, you will probably need to hire three separate teams, and the total price of your project may be three times higher, not to mention the delayed time-to-market. Xamarin is a universal tool that allows you to create a single application logic using C# and .NET for all three platforms at once. There are two ways of developing cross-platform apps using Xamarin. Forms technology allows you to design a visual interface once, attach some C# logic to it and share this codebase across Android, iOS and Windows platforms with some minor code changes. In this case, the UI code and the backend are pulled together for all solutions. 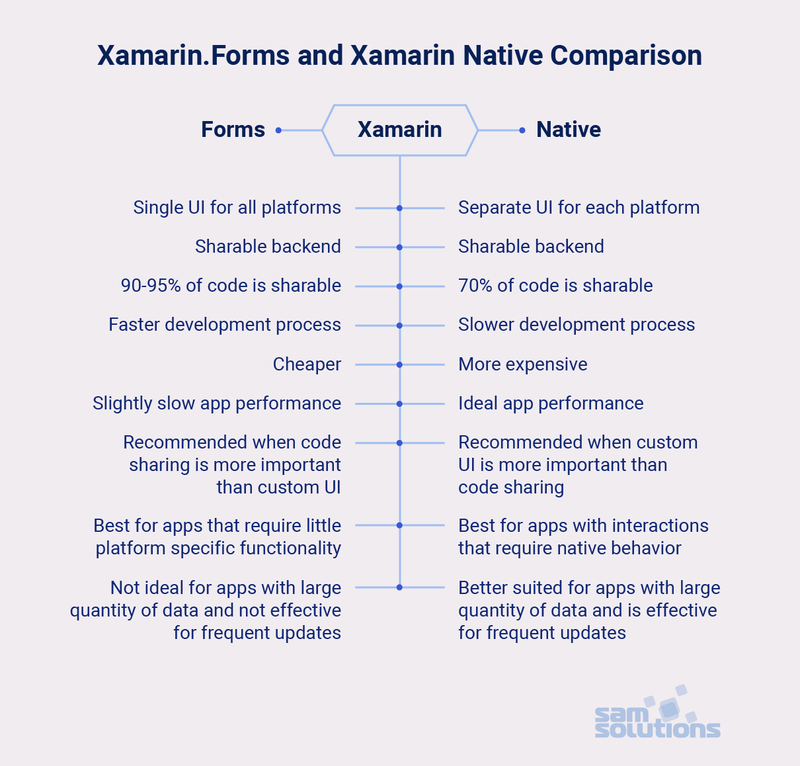 Xamarin Native includes Xamarin.iOS, Xamarin.Android and Xamarin.Windows libraries that allow you to design separate applications for each platform. In this case, the UI code is unique for each solution, but the backend is shared just as with Xamarin.Forms. Let’s discuss several important reasons to use Xamarin for cross-platform development. Xamarin has full access to native APIs and toolkits used on Android, iOS and Windows platforms. Consequently, it can provide native (or near-native) design and performance for every application. This fact makes Xamarin-based solutions surpass their hybrid competitors. One of the main pros of Xamarin cross-platform application development is that a single language C# creates all kinds of solutions. Moreover, there’s no need to switch between environments — everything can be done in Visual Studio. This is convenient and time-effective because developers perform the same process using one language instead of two different languages. Hence, Xamarin is easy to learn. A sharable codebase significantly reduces the development cycle. You code once and then can reuse a greater part of this code for other solutions, making only slight adjustments and not spending time on the same procedure. This greatly reduces the time of the development cycle and improves the time to market. 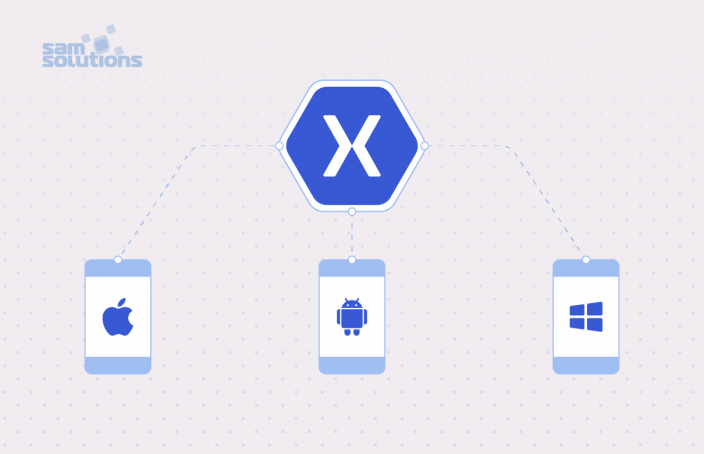 Xamarin also cuts costs due to its simplified development procedure and a full range of cross-platform tools that are built in the IDE without requiring additional expenses. It is remarkably easy to maintain apps developed with Xamarin.Forms as they share code. If you need to update applications and fix some issues, just do it in the source code, and all changes will be automatically applied to other solutions. Again, it saves time, developer involvement and finances. What’s more, the Xamarin community deserves respect. They provide comprehensive customer support backed with well-organized documentation and training opportunities. The platform offers comprehensive solutions to test and monitor application performance and UI – the Xamarin Test Cloud and the Xamarin Test Recorder. These tools allow you to run automated tests on multiple real devices in the cloud and find performance issues before the release. Xamarin is undoubtedly one of the leading and powerful tools for mobile engineering available today. It combines the best of native and cross-platform features. However, it may be a challenge to find professional Xamarin developers, since the community is not as large as for Android or iOS. If you are interested in using Xamarin to create iOS and Android apps, SaM Solutions can become your reliable partner. We have skillful Xamarin specialists who actively use this framework for cross-platform app development.